A requirement for a professional and high-quality translation of a text from one language into another, regardless of the field, is the absolute mastery of the source and target languages by the specialist translator. It is also essential that translations are undertaken exclusively into the native language. In Europe, where many countries border one another, the cooperative measures of the individual countries are increasing. With our pool of professional, highly qualified simultaneous and consecutive interpreters, we make an important contribution to the promotion of European understanding and agreement. We interpret from German into all European languages, and vice versa. Languages constantly evolve with the progress of technology and in the context of sociological changes. In a Europe without borders the institutions, corporations and government agencies today place the highest value on the expansion and optimisation of the language skills of their employees, through targeted language instruction and individual language training. What began with the idea of some visionary politicians in the fifties as a noble goal is now an influential confederation consisting, at present, of 28 Member States - from Latvia to Portugal, from Ireland to Greece. The single European market launched by those States is an economic entity of immense global importance. On the largest common market in the world which is created by this Union, there are economic connections that are formed not only in Europe, but also beyond. 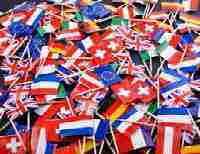 28 member states - a melting pot consisting of a variety of languages! The need for translations in different language combinations from the fields of science, technology, finance, advertising, medicine, law, etc. is equally diverse. With its linguistic diversity, our translation agency provides valuable services to all companies and institutions that are active at a European level. Language combinations such as German - English, French - Polish or English - Italian are just as much part of our repertoire as Finnish - Spanish, Portuguese - Dutch, Swedish - Danish and many other language combinations. As a language agency, we support the development of the global network and conciliate linguistically, in both the written and spoken word. We place a special value on a high level of quality management. The economic point of view here, in terms of a Europe growing together, is only one of many. The establishment of the European Union has led to the creation of a melting pot of diverse cultural, political, currency and relevant legal issues that is unparalleled worldwide. In this context, the concept of integration plays a significant role as it includes not only a linguistic competence for which it takes responsibility, but also a cultural courtesy. Since we, as a translation agency, place a corresponding value on ensuring that texts are translated by native speakers, the prerequisite of combining both language and subject know-how is fulfilled. The emergence and expansion of the EU has led to new practical requirements in business and in everyday life for universities and colleges. There is hardly a text category or event that requires a more in-depth subject knowledge or level of linguistic skill. Tender documents must be translated from German to English, declarations from German into English, technical operating manuals from German into Finnish. For medical congresses English simultaneous interpreters are needed, interpreters for Polish for training sessions, or a consecutive interpreter for meetings for the language combination English - French. Our daily workload also includes the translation of the commercial register excerpts from French into German, the translation of manuals, contract translations from German into Italian, expert opinion translations from German into Portuguese, as well as many other projects for specialist text translations. Specialised and experienced language experts will happily deliver the translation of technical texts in the field of architecture, the translation of building specifications, scientific translations in physics, biology, chemistry, etc. Furthermore, the translation of geological surveys from English into Danish, the legal translation of statements of claims, the translation of your presentations from Spanish into German, etc. "Foreign languages" have become "official languages", and the European Union currently has 24 official languages. We are proud, as a translation and interpreting agency, to unite specialist professional translators and interpreters under one roof and, in doing so, to support businesses and institutions in their activities on European terrain with our spectrum of languages. Within the context of business relationships to businesses with their headquarters in other EU Member States, time is often a scarce commodity; a problem for which we, in our translation agency, have the solution to hand. We are happy to process the translation of your patent documents using our express service. We are readily available for German - Dutch translations of framework contracts, and are happy to translate your documents overnight, over the weekend, or during public holidays. In addition to the areas of technology, economics or science, we are also happy to provide legal translations as a competent business partner at your side. Whether it be complex contracts that have to be translated, or negotiations that require an interpreter, a corresponding qualification and legal subject knowledge are essential, when the object of international cooperation is set in a legal context. We are happy to take on specialist translations and interpreting projects from German into all other European languages, but also from a European language into any other language. The current economic landscape provides another broad field of opportunities for us to provide support. We cooperate with companies from the automobile or real estate industry, but we also translate, for example, for universities with international ties. The European Union represents a significant professional challenge for the world of translation and interpreting. The level of mobility that exists today enables individuals to achieve their own goals more quickly and effectively. However, places abroad often present a linguistic barrier, for which we are at your side as a reliable business partner. This applies, for example, to the European employment market: Many companies found branches abroad, nevertheless, the employees who, in part, are sent around the globe, must still be able to communicate and make themselves understood. Simultaneous interpreters for international congresses and meetings regarding automobile manufacturing, agriculture, architecture, motor vehicle technology etc. Specialist translation for teaching and research as well as texts from the areas of geology, biophysics, chemistry, pharmaceutics etc. Similar conditions apply for the health sector in which hospitals or university clinics operate at a linguistic level that we are able to guarantee, thanks to our professional foreign languages service and its subject-specific knowledge base. The most important European establishments and institutions are the European Parliament, the Council of the European Union, the European Central Bank, the European Court of Justice and the European Investment Bank. These establishments determine and influence the economic, political and cultural developments through their legislation, legal framework and investment and currency policies across Europe. This is exactly where our professional foreign languages services come into play, as the implementation of EU laws, directives and provisions leads to a continual process of adaptation and further development for individual, cross-border companies, institutions, universities, authorities or hospitals, which has been noted due to a continued increase in the need for translation and interpreting services. Due to the fact that customer satisfaction is at the centre of everything we do, we place enormous value on ensuring that our employees are right up-to-date in their respective specialist area, and that they are able to keep pace with the process of adaptation and development. These different aspects create an enormous amount of text that our company is ready to translate as necessary. We take on the translation of specialist currency policy texts from French into German, economic translations from German into Finnish, the translation of texts from the fields of politics and political sciences from German into Danish, as well as texts from the arts and culture, from German into Swedish etc. The task of translation is no longer an activity that is simply done alongside other tasks or after business hours, especially on a networked, multinational European platform. An institution that consists of 24 official languages with legislative and political functions demands that pace is maintained, on the one hand, with the rapid development of language and subject-specific terminology, and continued process of development in technology, ecology, law and culture, on the other. Our company works from, and in, all world languages, for example, translation from German to English, translation from English to German or German to French. A particular feature of this is the contribution to the various processes of unification in Europe, thanks to our wide-ranging language offer. This not only includes aspects of economics but also culture. Europeans, as well as the inhabitants of all other continents, have relationships in place with other countries that predominantly have a professional or personal foundation. Language specialists are also required in this respect in order maintain and strengthen such relationships. The European and international market places emphasis on economic cooperation and associated future development. As a translation agency, we are a sought-after business partner for all industries, as well as for science and research. Specialist and experienced language mediators are available to you in the fields of journalism, tourism, ecology and electrical engineering. We also partner companies from the fields of energy, ship construction, physics, mechanical engineering and logistics. It should also be noted that we operate, in addition to the foreign languages support that we provide, within a cultural sphere, the importance of which should not be overlooked. In this regard, we also provide a service to religious institutions, charities and many other public organisations.